This site is mainly for collectors of pre-1945 guidebooks from the famous Baedeker publishing house, but also for anybody with an interest in armchair travel in time and space. 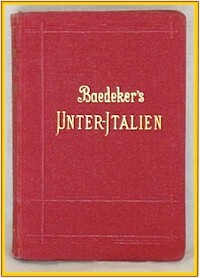 The scope of this site covers 992 Baedeker editions in German, English and French. It includes hints on what to look for when buying them, current pricing information and other data which may be helpful to the collector. To find out exactly what is in store for you, read about this site. To find information about an edition, use one of the search options on the Find editions page. We hope to be adding more features in the future, and if you have any wishes, or perhaps would like to add or correct some information, please contact us on the e-mail address below. malheureusement il n'est pas encore possible de présenter ce website en français. Peut-être je pourrais arranger une traduction à l'avenir. En attendant, vous pouvez m'écrire en français - même si la réponse peut être en anglais.